I recently downloaded the free summer license for RobotC with the intent of using it to play with the Nothing But Net RVW. I installed RVW license. 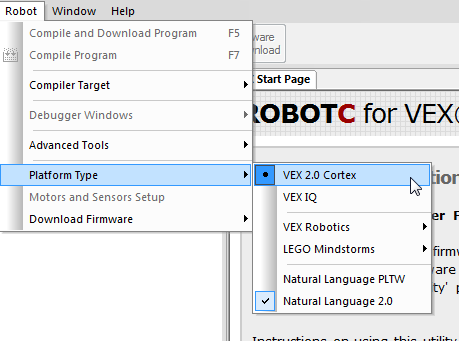 When I go to Window and click on and select Virtual World to Use, the only options that come up are Curriculum Companion 4.2.7 and Challenge Pack for VEX IQ. I tried downloading and installing the other virtual worlds packages by following some of the directions I have found on the forum and through RobotC but I still cannot seem to access them. Any advice? Please be sure that your current platform type is VEX 2.0 Cortex. After assigning the correct platform you will be able choose Nothing But Net as a virtual world.